Last year’s edition was very popular, so it’s back. 8 more Node ‘habits’/best practices to consider. Summary of an academic paper investigating causes of concurrency bugs in server-side event-driven systems, i.e. Node in this case. 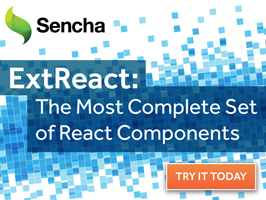 Learn how to build data-intensive, cross-platform web apps leveraging over 115 Sencha components and React. If you haven’t dug into the new goodies yet, this is a good roundup of the latest developments on the Node ecosystem’s most important tools. Brings together the Twilio telephony and StdLib serverless Node platforms in a very rapid way. If you only need to support modern browsers this modern alternative to cross-site request forgery tokens is worth a look. FuseBox: A Faster, Simpler Webpack Alternative? Feras Khoursheed introduces us to Fusebox, a lightweight module bundler that serves as a simpler and potentially more flexible Webpack alternative. A very minor bugfix update. Nodevember is a two-day Node conference (Nov 27-28 in Nashville, TN). Manifold enables you to purchase everything from RedisGreen to CloudAMQP with one account, on one bill. How to efficiently debug Node programs using the latest Google Chrome DevTools. Automatically scale up and down to handle increased workloads and avoid wasting money on idle resources. Uses bindings to pugixml, a fast C++ XML parser.